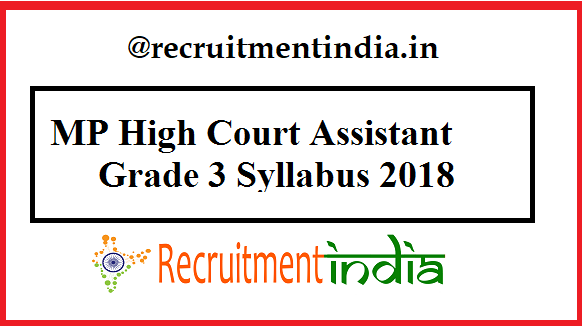 Free MP High Court Assistant Grade 3 Syllabus 2018 download link is provided to the job applicants. Those who read the MPHC Sahayak Grade 3 Syllabus pdf have more chances of cracking this page. MP High Court Assistant Grade 3 Exam Pattern is beneficial to the applicants to qualify in the exam. In the MP High Court Sahayak Grade 3 Exam, typing test has highest marks allotment, so exam attendees daily practice it. Along with typing practice, learn all the topics named in the given Madhya Pradesh HC Assistant Grade 3 Syllabus pdf. 1.1 MPHC Sahayak Grade 3 Syllabus. Madhya Pradesh High Court Recruitment panel has initiated the application process for the 49 Assistant (Sahayak) Grade 3 Posts. A lot of candidates number of times more than the available posts will apply for the recruitment. To face the competition from the plenty of applicants gets this MPHC Safpahayak Grade 3 Syllabus 2018. MP High Court implementing a very easy selection process which is according to the job profile of the Assistant Grade 3 post. Those who have seen the given below MP High Court Assistant Grade 3 Syllabus 2018-19, will felt that in view of the job profile the applicants are going to be selected by the High Court of Madhya Pradesh. MPHC Sahayak Grade 3 Syllabus. Candidates have to give more time for the practicing of typing using either computer or laptop than reading the MP High Court Assistant Grade 3 Syllabus pdf. Entire MPHC Sahayak Grade 3 Selection Process is for 100 marks. Out of 100 marks, 80 marks are only for the typing test. This much priority of marks in the MP High Court Assistant Grade 3 Exam is given for the typing is because of the job profile. Almost the working profile of these posts is linked up with the typing, so the MP HC employment panel decides the eligible candidates for these posts on the basis of Typing test marks. Remaining 20 marks is for the Computer knowledge and GK. In this kind of MP State Govt job, every mark matters for the selection of the candidates. So don’t neglect the reading the topics from the MPHC Sahayak Grade 3 Syllabus. Candidates have to practice the typing on the computer or laptop regularly. Recruimentindia.in giving the MP High Court Sahayak Grade 3 Syllabus along with the recruitment notice why because, after checking the MP High Court Assistant Grade 3 Recruitment Eligibility, without filling the application form candidates will search for the MPHC Assistant Grade 3 Exam Pattern. On seeing this scheme of examination, they will come to the conclusion of are they capable of this recruitment or not. If the exam is so complex, few of the candidates will drop out of the competition. That’s why rapidly MPHC Sahayak Grade 3 Syllabus pdf attachment is conveyed to our visitors from this page. The MPHC Assistant Exam is very simple, if you are best at typing, then this job is yours. More probability of acquiring this court job is there for the candidates who have the Typing skills. But along with these skills, the final selection will be there only if they have read the MP High Court Assistant Grade 3 Syllabus. On the other hand, applicants, who don’t have these skills no need to worry about it. You have the time to learn the skills earlier to the commencement of the exam date. If you start practicing from now onwards regularly, you can improvise it by the time of examination. So give the time for Typing and MP HC Sahayak Grade 3 Syllabus preparation. All the topics related to computer and GK are clearly listed by Recruitmentindia.in team, so other searches for the syllabus is not obligatory for the postulants who have downloaded the latest mphc.gov.in Assistant Gr 3 syllabus through this page. Write as many mock exams using MPHC Assistant Grade 3 Previous papers.